A few weeks ago, GFR reported on a robot that had trouble figuring out how to “save” robots representing humans during a study. The automaton was often unable to figure out whether to save one human-bot or the other, often resulting in it being stymied into a state of paralysis, resulting in the “death” of both. While it was clear that the robot was having an Asimovian breakdown because it couldn’t save everyone, researchers couldn’t tell what the reasoning was—or how exactly the programming functioned (or didn’t, as the case may be). But now, thanks to another advancement at MIT, we may be able to read robots’ minds, or at the very least, gain some insight into their intentions. The scientists used a simpler task than the one that stymied the robot before—this time, instead of saving a human, they only had to reach the other side of the room without crashing into the “pedestrian.” Thus, what the robot has to “think” about is the best route, the one that will both minimize an encounters with the pedestrian while getting it across the room as quickly as possible. Thanks to a new visualization system, called “measurable virtual reality” (MVR) by its creators, scientists can see the robots “thoughts,” or at least their process. The new system uses projectors on the ceiling, motion-capture technology, and animation software. As the robot tries to figure out the best route, the MVR system projects onto the ground a large pink dot that follows the pedestrian, indicating the robot’s understanding of the pedestrian’s position. 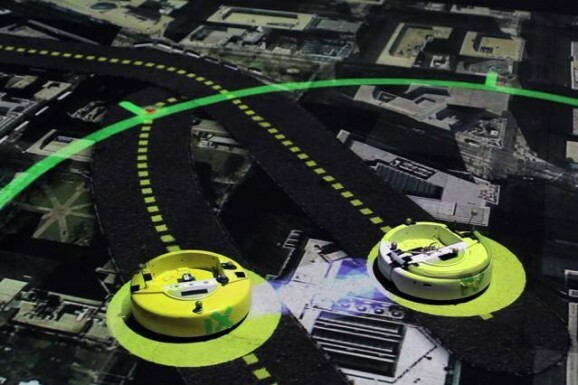 Different lines are projected on the floor, showing the possible routes the robot might choose, and the best route is shown in green. The lines and dot move around as both the robot and the pedestrian shift. Seeing what the robot’s thinking in real-time can help avoid crashes, as codes can be terminated before any disasters occur. This may help designers identify and fix problems more quickly as well, which would also aid in the development of driverless cars and other autonomous robots, such as drones that fight fires.